Emphasis on interpreting circuit schematics and creating corresponding physical circuits. Utilizing the Analog Discovery's arbitrary waveform generator to provide the necessary amount of voltage for a multiple source circuit. Using the Analog Discovery's arbitrary waveform generator to create a voltage source that's greater than 5V. In this activity, we will use the Analog Discovery™ to create a voltage source that's greater than 5V. Since the individual supplies on the Analog Discovery are limited to 5V, we will use two Analog Discovery supplies —V- and the Arbitrary Waveform Generator—to create the desired voltage. A side effect of the use of two power supplies in this circuit is that the Analog Discovery ground is not directly connected to any of the circuit components on our breadboard! Ground in this circuit is strictly internal to the Analog Discovery. Complete the first and second Circuit Implementation projects. Be able to use the Analog Discovery to implement voltage sources greater than 5V. Be able to complete the Challenge problem at the end of this exercise. 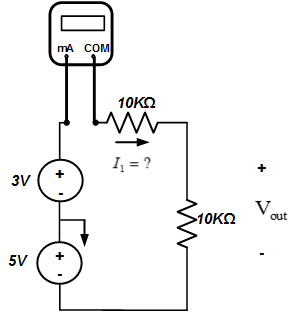 Think of this circuit in a simpler form; what can we use on the Analog Discovery that would produce 8V? The bottom schematic shows the source breakdown. The ground connector is not needed in this circuit. Use W1 to apply 3V across the circuit (we will demonstrate how to set the W1 connector to the proper voltage level further through this exercise). 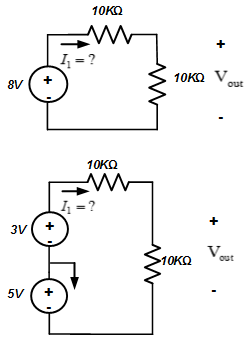 Use V- to apply -5V across the circuit. The resistors limit the current. In order to measure the current I , we need to re-configure the circuit to put the ammeter in line with the 10kΩ resistor. The schematic to the right shows placement of the ammeter. Label nodes (A, B, C, D, E) as points that connect two or more circuit components. Each node on the schematic corresponds to a separate row of holes on your breadboard. Arbitrarily pick different rows of holes in the breadboard and assign them to the nodes identified in part C.
Note: we won't actually connect anything to node “E” on the breadboard. Node “E” indicated in Part C is internal to the Analog Discovery—since all sources on the Analog Discovery are relative to the Analog Discovery ground. The DMM's µA mA terminal and the W1 connector are at node A. The DMM COM terminal and the 10kΩ resistor are at node B. The 1+ connector and both 10kΩ resistors are at node C.
The 1- connector, the 10kΩ resistor, and the V- connector occupy node D.
Nothing is connected to the breadboard's node E on our circuit. Node E is inside the Analog Discovery! 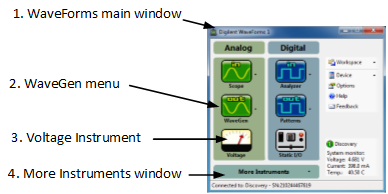 Click on the WaveGen instrument icon to open the Arbitrary Waveform Generator window. Open the Voltmeter instrument under the More Instruments Menu to display the measured voltage. Select the Constant wave under the Basic tab. Set the Offset value to 3V. Turn on power to the circuit. The above screenshots are of Digilent WaveForms running on Microsoft Windows 7. Your measured voltage should be approximately 4V. Your measured current should be approximately 0.4mA. Try reversing placement of the AWG and the -5V connectors. This should just change the sign on the displayed voltage. Exchange the µA mA and COM terminals on the DMM. This should just change the sign of the current displayed on the DMM. 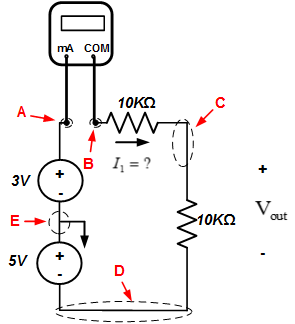 Reconfigure your circuit so that the ammeter is between the two 10kΩ resistors. Your measured current should still be about 0.4 mA—the same as it was before. Does this result make sense? If you are confident with your knowledge of multiple source circuits and would like some extra practice, we have provided an extra problem in the link below. This problem requires that you understand the concepts introduced throughout this exercise.